Jeff Hopkins has experienced every possible emotion in his short sporting career but if there's one thing that's been constant in his life it's the support of his friends Skerries Golf Club. Having seen his promising football career cut short at the age of 15 by Osgood-Schlatters Syndrome — he had trials with Liverpool, Blackburn Rovers and West Bromwich Albion — the 25-year old rookie professional suffered another massive blow in January this year when his mentor and close friend, Wayne Westner, took his own life. The charismatic South African, a long time resident in Celbridge before returning to his native country a few years ago, helped Hopkins rebuild his game, living with him in Durban and even caddying for him when he won his card at the Sunshine Tour Q-School. "It hasn't been easy to replace Wayne, who was like a father figure to me," Hopkins said. "It was tragic what happened to Wayne. He was a mentor and a friend. "I went out to South Africa on my own and Wayne wasn't just my coach, he was my family and my friend. So it took a couple of months to get back on track after he passed away and everything is very positive now." Westner's loss was a huge blow to his family and friends, including Hopkins, who lost his full Sunshine Tour privileges in the aftermath. "The last 20 months have been a huge learning curve for me, but the good thing is that I know I have the game to compete out there," Hopkins said. "But I need to put that financial structure in place to be able to get back out there and compete. "I played on the Sunshine Tour until March and have played Big Easy Tour events and Mena Tour events since then. "But with Wayne passing away, that was a major hiccup along the road and it's been hard to find my feet after that." It's no surprise that the 2016-17 season has been one of major upheaval for Hopkins but the massively talented Dubliner is hoping a September 15 fundraising golf day at Skerries will help him take the next step on the road to becoming the successful tour pro that Westner predicted. After playing a mixture of Sunshine Tour, Challenge Tour, Mena Tour, Big Easy Tour and IGT Tour events this season, he's hoping as many people come on board as possible so he can fund his trip to the European Tour Q-School this autumn. "I've started working with a new coach, Doug Wood, and we spent two months solid reconstructing my golf swing and it is really starting to work," Hopkins said this week. 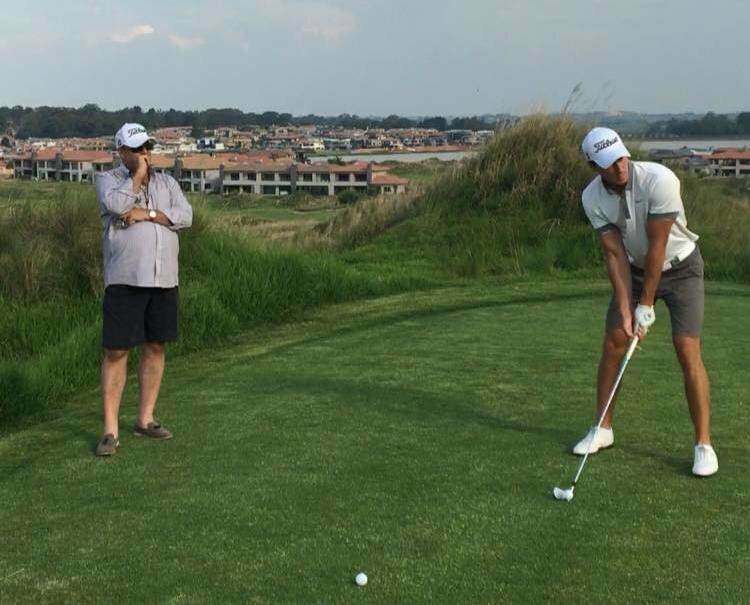 "He works with a lot of guys on tour like Trevor Fisher Jnr and George Coetzee and a lot of the full-time European Tour players. "I am learning all the time — it's never ending — but my game is better than it's ever been and now the plan is to put a structure in place so I can play full time and give myself the opportunity to achieve what I'd like to achieve. "Finding Doug as my coach has been big for me because it took me a few months to find someone to replace Wayne, who was huge for me. "I had three months after Christmas trying to do it on my own but you really need to have someone you can trust and I have found that person in Doug." The September 15 fundraiser will be a day-long, four-man team event, run in association with one of Hopkins' sponsors, Contour Greens. "A lot of members from Royal Dublin, who I played for towards the end of my amateur career, will also be coming on the day and I am grateful to a lot of people for their support," Hopkins said. "I have great people around me and my friends helping me put this golf day together, which is really important for me because as you know, playing on tour, even doing it on a shoestring, is a very expensive business. "People are really rowing in behind me and they are not doing it for no reason, they know there is a bigger picture here and I am going in the right direction. "It could cost anything from €5,000 to €7,000 to go to Q-School, depending on how far I go, so to be comfortable for a whole season, it's going to cost around €40,000-€50,000 without any frills. "I mixed and matched Sunshine Tour with Challenge Tour last year and ended up playing 37 events trying to keep my Sunshine Tour card and I just ended up playing too much and burning myself out. "It's all a learning curve so, in order to avoid that and to be able to plan things properly and create a proper schedule, it's important to have this financial structure in place." For more information about Jeff Hopkins' September 15 fundraiser contact Jeff on 087 1370933 or visit jeffhopkinsgolf.com for more details on how to sponsor a team on the day.